Three boys were heading home from school one day when one started the time-honored game of paternal one-upmanship. He said, "My dad's way faster than any of yours, he can throw a 90-mph fast ball from the pitcher's mound and run and catch it just after it crosses the plate!" One of the other boys said, "Oh yeah? 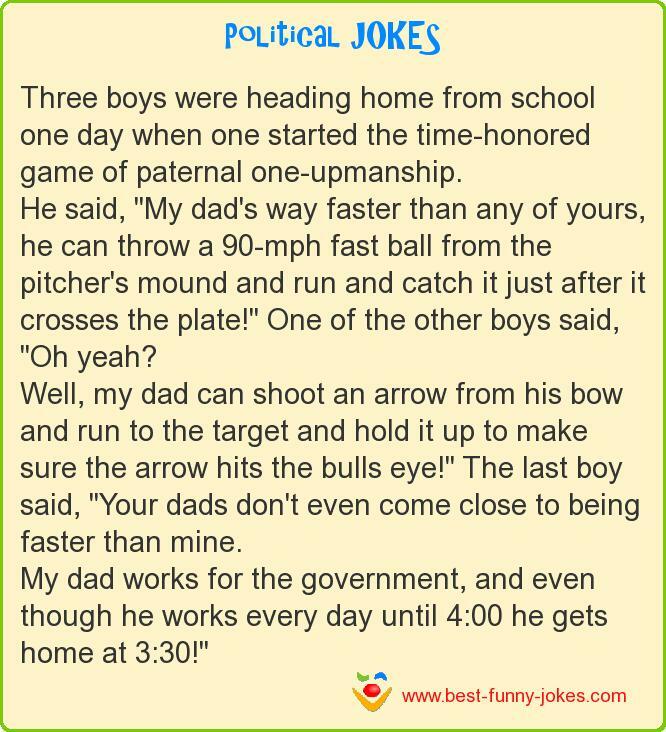 Well, my dad can shoot an arrow from his bow and run to the target and hold it up to make sure the arrow hits the bulls eye!" The last boy said, "Your dads don't even come close to being faster than mine. My dad works for the government, and even though he works every day until 4:00 he gets home at 3:30!"